August Krogh became an internationally well known biomedical scientist during the first decade of the 20th century. A series of works published in 1910 (“the seven little devils”) attracted special attention because he could demonstrate that “the absorption of oxygen and elimination of carbon dioxide in the lungs take place by diffusion and by diffusion alone. There is no trustworthy evidence of any regulation of this process on the part of the organism.” He thereby corrected his master, professor, Christian Bohr and created a conflict with him that was never resolved. Krogh’s original works on “the capillary motor regulating mechanism” for which he was awarded the Nobel Prize in Physiology or Medicine in 1920 were, however, not published until 1918 (in Danish) and 1919 (in English). Having obtained this prestigious distinction, August Krogh was invited to the U.S.A. in 1922. His wife Marie, who, probably in 1921, had been found to have maturity onset diabetes, joined him on the trip. At a private dinner, Marie Krogh was told by the renowned American diabetologist Eliot P. Joslin that insulin had just been discovered and purified in Toronto. August and Marie Krogh therefore extended their journey and spent the November 23-25 in Toronto as John Macleod’s guests. During his stay in Toronto, Krogh obtained a license which allowed him to use the protocol for insulin purification developed there. Production was started immediately upon his return to Copenhagen on December 12. The first patient was treated as early as March 13, 1923. Together with the Danish physician H. C. Hagedorn, Krogh then founded the Nordic Insulin Laboratory and the Nordisk Insulin Foundation (formally approved by the authorities in 1927). This became the starting point of a very successful Danish pharmaceutical company and a research fund, which today constitute the company Novo Nordisk and the Novo Nordisk Foundation, respectively. However, soon thereafter Krogh left the business so he could concentrate on his scientific work. Marie Krogh’s diabetes was successfully treated with insulin, and when she died of breast cancer in 1943 none of their four children were aware that she had, in fact, also suffered from diabetes. The Nobel Prize in Physiology or Medicine in 1923 for the discovery of insulin was divided between Frederick G. Banting and John J. R. Macleod. The choice of this combination of Laureates has been much debated ever since the prize was awarded. Thus, for instance Banting shared his part of the prize amount with his younger coworker Charles Best. It is very unusual for someone to receive the Nobel Prize in Physiology or Medicine the same year as he or she is nominated for the first time. However, as can be seen from the archive material of the prize awarding institution (The Nobel Assembly at Karolinska Institutet in Stockholm) this was true for both Banting and Macleod. They published their work on the discovery of insulin in 1922 and were nominated for the first time in 1923: Banting by G. W. Crile (Cleveland), F. G. Benedict (Boston) and August Krogh; and Macleod by G. N. Stuart (Cleveland) and August Krogh. Charles Best, on the other hand, was never nominated at this time (only nominated candidates can be considered for the prize). Written evaluations of Banting’s and Macleod’s scientific contributions were provided by two members of the Nobel Committee, John Sjöqvist (professor of chemistry and pharmacy) and Hans Christian Jacobaeus (professor of internal medicine). Sjöqvist arrived at the same conclusion as August Krogh, i.e. that the prize should be divided between Banting and Macleod. Professor Göran Liljestrand was the secretary of the Nobel Committee during the years 1918-1960. He was a great friend of August Krogh and had been in close contact with him since his time as a visiting scientist in Copenhagen. It is therefore of interest to study the correspondence between Liljestrand and Krogh, which today is included in the archives of the Royal Swedish Academy of Sciences. In this correspondence, the Nobel Prize for the discovery of insulin is only mentioned on two occasions and very briefly. Letter from August Krogh to Göran Liljestrand dated January 20, 1923. Part of the second page of a four-page letter from August Krogh to Göran Liljestrand dated 20 January 1923. “Du vil se af foredraget at jeg anser insulinets opdagelse for at vaere af ganske overordentlig baade teoretisk og praktisk betydning og det vil naeppe overraske Dig at jeg agter at indsende forslag om at Nobelprisen tildeles Dr Banting og Prof Macleod i forening.”. For translation from Danish into English, see text above. Letter from August Krogh to Göran Liljestrand dated February 4, 1924. Thus, it seems reasonable to assume that Krogh’s nomination had some impact on the awarding of the prize to Banting and Macleod. After all he was a Nobel Laureate and had, in addition, personal knowledge of the situation in Toronto. Some additional information that might shed some light on the situation can be obtained from the Nobel Archives. Thus, Paulescu was never nominated; Collip and Best were nominated but not until 1928 and 1950, respectively; von Mering was nominated but only in 1902 and 1906; while Minkowski was nominated in 1902, 1906, 1912 and 1914 as well as in 1924 and 1925. Thus, according to the statutes of the Nobel Foundation, none of these candidates could have received the prize in 1923. 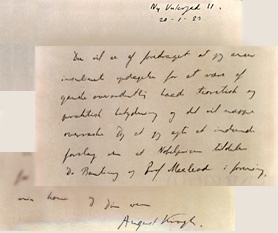 So perhaps “the choice made was the best possible.” Or would it have been wiser if the Nobel Committee at that time had explored the situation in greater depth rather than proposing to the Medical Faculty of Karolinska Institutet (the decision-making body) that Banting and Macleod be awarded the prize at such an early stage after their discovery? The author gratefully acknowledges the Center for History of Science at the Royal Swedish Academy of Sciences and the Nobel Assembly at Karolinska Institutet for allowing me to study and reproduce the correspondence between August Krogh and Göran Liljestrand and to use the archive material related to the present topic, respectively. Bliss, M: The Discovery of Insulin. McClelland and Stewart, Toronto, University of Toronto Press, 2000 (originally published in 1982). Lindsten, J: Schack August Steenberg Krogh – a versatile genius. Nobel e-Museum, 2001. Luft, R, Vem upptäckte insulinet? Läkartidningen 1971, 68, 4997-5004. Jan Lindsten (b. 1935) obtained his B. Sc. in 1958, Ph.D. in 1963 and M.D. in 1969. Since 1970 he has served as professor of Medical Genetics at Karolinska Institutet in Stockholm, was Dean of the Medical Faculty between 1996 and 1998, and Professor emeritus of this institute since 2000. Lindsten has served in various capacities at the Karolinska Hospital, Stockholm: head of the Department of Clinical Genetics between 1970 and 1990, chief medical officer between 1987 and 1990, and chief executive officer between 1990 and 1994. In 1994-1996 he was chief executive officer at the National University Hospital in Copenhagen, Denmark. Lindsten was secretary general of the Nobel Assembly and the Medical Nobel Committee as well as member of the board of the Nobel Foundation between 1979 and 1990. He is a member of the Swedish Royal Academy of Sciences and honorary member of the Finnish Medical Association.